Get in touch with us—call, use our online form or connect via our live chat. Give feedback_0 Created with Sketch. If you have any general queries or specifically related to billing, you can contact us via calling, visiting your local Commander centre or through our live chat. Times are AEDST. Send us a message and we we’ll get back to you via a phone call or email within 48 hours. Please provide at least one method of contact so that we can get back to you. Commander does not currently offer any Telecommunications Products specifically suited to users with a disability. 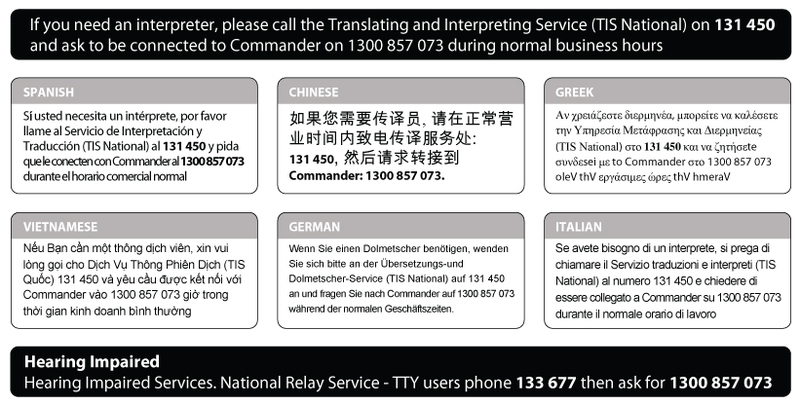 For information about suppliers and types of equipment available, contact the NRS Helpdesk on 1800 555 660 (voice), 1800 555 630 (TTY), 1800 555 690 (fax). Commander Power & Gas (CPG) allows you to register your details to avoid receiving unsolicited marketing from CPG, even if you are not a CPG customer. Recent amendments to the Electricity Industry Metering Code now allow CPG to provide you with your meter data. or by submitting a request to [email protected]. Please tell us if you have any concerns or complaints about our service. We at Commander Power & Gas are committed to providing excellent customer service. To do that we need to know where things are going wrong, and we need you to help us. So please tell us about any concerns, problems, or complaints you may have about our products or services. We also welcome any a helpful comments or compliments you may want to make about our staff or products. We do take your feedback seriously, as we think it is the best way for us to identify and correct our problems, all of which will help improve our services to you. Please call us on 1300 857 073 and let one of our customer service representatives know about your problem or complaint. We will try to resolve your problem right away, and if we cannot, we will take steps to get the problem resolved as quickly as possible. [email protected] – Complaints - If you have a compliant that you would like resolved, you can e-mail this address. Please provide your username, account number, date of birth, contact phone number, your address, and details of your complaint. [email protected] –Compliments and feedback - Not looking for a reply and just want to provide us with general feedback or wanting to pass on a compliment about one of our staff, please email this address. *[email protected] – Privacy complaints *- If your complaint relates to how we have collected, held, used or disclosed personal information, please address your complaint our Privacy Compliance Officer. *Remember *- we are always happy to provide you with a written response, all you have to do is ask. If you are unhappy with our efforts to resolve your complaint or problem, then you have the right to ask to have your complaint referred to a higher level within our customer service centre. We will have a complaint manager review your problem and provide you with a prompt response. You can also get an independent review of your complaint. If you remain unhappy with our resolution of your complaint, you also have the right to refer the complaint to your local Energy Ombudsman (see below). Each state’s has an Ombudsman service which is a free and independent alternative dispute resolution scheme for energy customers.